The paintings used as illustrations in the book became a touring exhibition. Central to the collection was an expanding group collage floor installation inspired by the textures patterns and colours of the moorland floor to which artists, community groups, children and craftspeople from all over the country were invited to contribute. We hosted other events and workshops alongside and it was open to the general public, including families, to experience, see and understand the ecological messages it conveyed. In 2012 the exhibition was hosted by the Dales Countryside Museum, Hawes and The Station, Richmond. During 2013 it was held in The Folly, Settle, and in September part of it went to the Visitor Centres at Edale and Castleton in the Peak District. In 2014 it was at Brockhole in the Lake District from February through to mid April, at Clitheroe Castle in Lancashire through Mid May to Mid June, and at Kirkleatham Museum near Redcar from October through to April 2015. 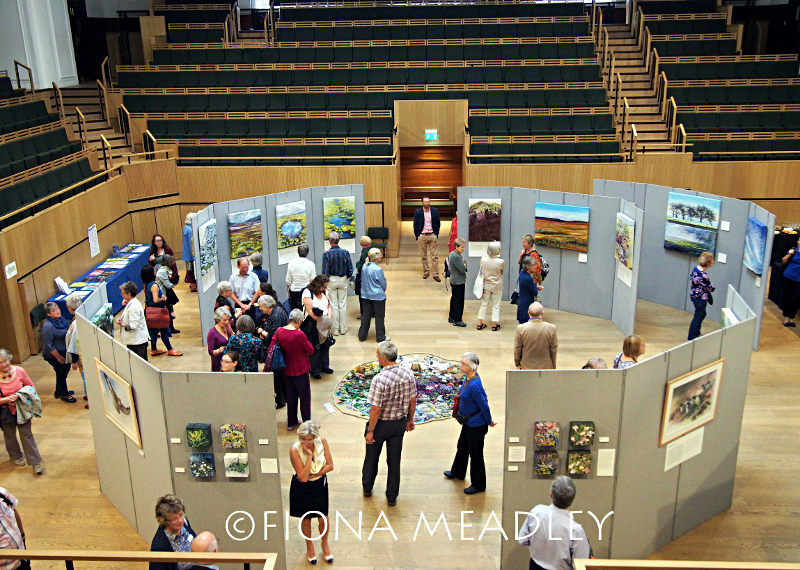 Thanks to the Quaker Arts Network, Climb up to the Moor had a very popular showing in 'The Light' - www.friendshouse.co.uk/thelight - at Friends House on Euston Road (opposite Euston Station) in London from 18 - 29 August 2015. Later that year a hugely successful selling exhibition was hosted by Tennants of Leyburn from late October through to mid November 2015. 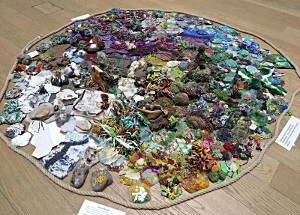 The expanding group collage floor installation - "Groundcover"
"A real celebration of nature helping us to touch the earth." "Spiritual interpretation of the moors – superb"
"Stunning. The 'tops' are close to my heart. I feel very humble, thank you." "Inspiring and beautiful. The underlying message is salutary – I shall bring my grandchildren." "Absolutely beautiful. The moorland is vibrantly alive." "The paintings opened up the diversity of wildlife and the habitat for me. I hadn't seen the range of colours and the richness of that environment so clearly before - I've since been again to the moors and I'm seeing it with new eyes." "Really lovely exhibition which captures the diversity of weather and seasons in all their glorious colours. Love it!" "My nine year old daughter loved the exhibition, particularly the animals, but all the paintings spoke to her and affirmed her love of the natural world." "The delicate ecological balance of flora, fauna and the elements was vividly portrayed in this beautiful exhibit. Through this, I was also made aware of the moor's complexity with its abundance of species and the variety of the geophysical areas."